The Glass Castle 1 Edition The first book by the beloved author of the new novel The Silver Star, the extraordinary, one-of-a-kind, "nothing short of spectacular" (Entertainment Weekly) memoir from one of the world’s most gifted storytellers that has been on the New York Times bestseller list for more than six years.The Glass Castle is a remarkable memoir of resilience and redemption, and a revelatory look into a family at once deeply dysfunctional and uniquely vibrant. When sober, Jeannette’s brilliant and charismatic father captured his children’s imagination, teaching them physics, geology, and how to embrace life fearlessly. But when he drank, he was dishonest and destructive. Her mother was a free spirit who abhorred the idea of domesticity and didn’t want the responsibility of raising a family. The Walls children learned to take care of themselves. They fed, clothed, and protected one another, and eventually found their way to New York. Their parents followed them, choosing to be homeless even as their children prospered. 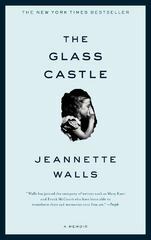 The Glass Castle is truly astonishing—a memoir permeated by the intense love of a peculiar but loyal family.